Ensure that the cable compatibility with the equipment. Connect the reusable cable to the monitor, and turn the monitor on to allow the electronics to warm up. The Using aseptic technique, remove the transducer and kit from the sterile packaging. Add additional components as needed to complete the monitoring system per hospital policy. Connect the transducer cable to the reusable cable. Remove all air from the heparinized IV flush solution bag per hospital policy. Caution: If all air is not removed from the bag, air may be forced into the patient’s vascular system when the solution is exhausted. 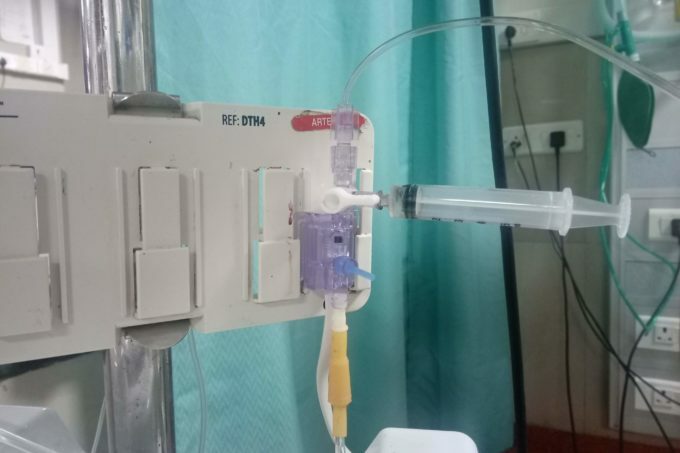 Close the roller clamp on the IV set and connect the IV set to the IV flush bag Hang the bag approximately 2 feet (60 cm) above the patient This height will provide approximately 45 mmHg of pressure to the prime setup. Fill the drip chamber halfway with the flush solution by squeezing the drip chamber. open the roller clamp drip chamber. Open the roller clamp. For transducers without integral flush device (Snap-Tab) fill system per hospital policy. Flow is provided by pulling on the Snap-Tab and discontinued by releasing the Snap-Tab. Kits with W sets attached, open the transducer vent port by turning the stopcock handle. Deliver flush solution first through the transducer and out through the vent port, then through the remaining kit by turning the appropriate stopcocks. Remove all air bubbles. Caution: Significant distortion of the pressure waveform or air, emboli can result from air bubbles in the setup. Replace all vented caps on side ports of the stopcocks with no vented caps. Mount the transducer either on the patient’s body per hospital procedure or on an iv pole using the appropriate clamp and holder. if older is used, snap transducer into place. Pressurize the IV flush solution bag. The flow rate will vary with pressure across the flush device. The flow rates with the W bag pressurized to 300 mmHg are as follows: 3+/- 1 ml/hr. (DPT with blue Snap-Tab) 30 :1: 10 ml/hr (DPT with yellow Snap-Tab). Connect pressure tubing to the catheter per manufacturer’s instructions. Flush system per hospital policy. After each flushing the arterial pressure line, confirm there is no air bubble in Pressure monitoring line. Adjust the level of the transducer vent port (the fluid-air interface) to correspond to the chamber where the pressure is being measured. For example, in cardiac monitoring zero at the level of the right atrium. This is at the phlebo-static axis, determined by the intersection of the midaxillary line and the fourth intercostal space. Remove the non-vented cap and open the vent port to the atmosphere. Adjust the monitor to read zero mmHg. Chest monitor (calibration using procedure recommended by the monitor manufacturer. Use the Model PXCAL Pressure Transducer Simulator/Tester in conjunction to verify pressure readings without compromising. The sterility of the system instructions included with the Pressure Transducer Simulator/Tester tubing set. Close the atmosphere and replace the non-vented cap. The system is ready to begin monitoring pressure. Warning: Abnormal pressure reading should correlate with the patient’s clinical manifestations. Verify transducer function with a known amount of pressure before instituting therapy.